Transport Services at Gould Transport, Kalgoorlie Western Australia. Bulk Haulage Transportation, Road Design and Construction Service, Ore Haulers and Bulk Haulage Services for the Mining Industry in Western Australia. 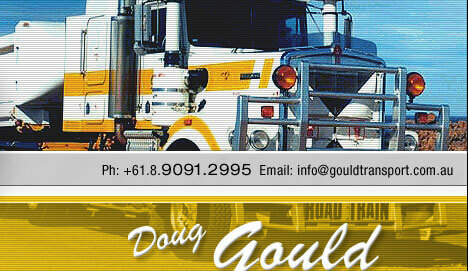 Located in the Goldfields Kalgoorlie Region Gould Transport holds the World Records for the Longest Road Train. Kenworth Trucks, Jobs and Employment for Road Train Transport.